A surprise bbq to celebrate a milestone birthday on a private estate filled with beloved family and friends on a beautiful late summers day couldn't be considered anything but la dolce vita. 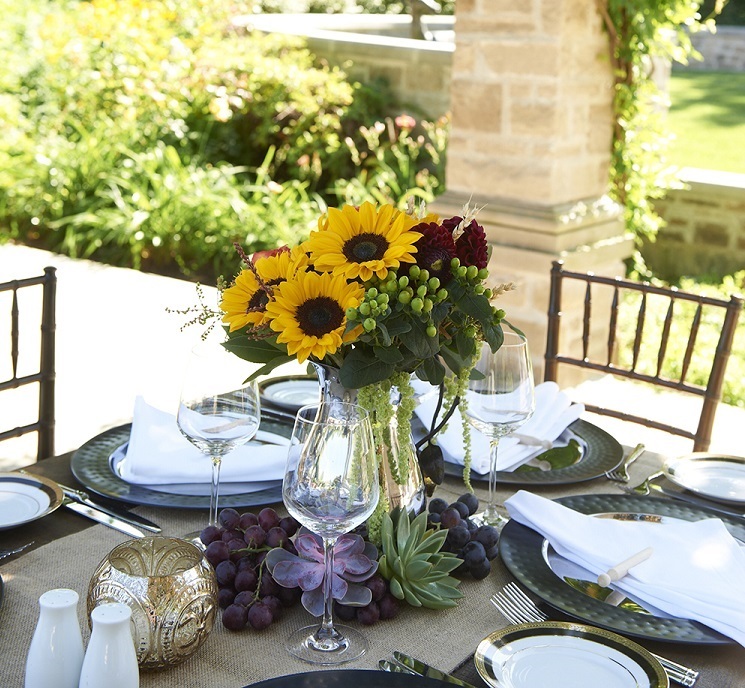 Al fresco was the theme and guests were transported to a sunshine filled, bright and airy Italian vinyard. Burlap runners on simple wooden tables were adorned with hammered aluminum lemonade pitchers filled with garden style arrangements of cherry red dahlias, green hanging amaranthus, lush Milva roses, mini sunflowers, fresh green hypericum berries, juicy blue viburnum berries, mopheaded safflowers, burnt orange callas, golden wheat and cascading pieris buds. Clusters of fresh grapes and succulents scattered on the table added to the fresh picked vibe. Even the clothes peg adorned napkins made one think of a sweet Italian nonnas garden supper! Wine barrel bars were a hit with the wine loving crowd and made for a stunning presentation of an antipasto bar. Custom engraved wooden wine boxes tied with burlap ribbon and rustic twine made beautiful thank yous for the guests.